Deputy Prime Minister Hon. Sam Condor has again called for changes to the Federationâ€™s 26-year-old independence constitution as it continues to stifle the social, political and economic development of St. Kitts and Nevis. He said even in the recent High Court case brought by the opposition Peopleâ€™s Action Movement (PAM), seeking a judicial review of the Constituency Boundaries Commission Report at the Lee Llewellyn Moore Judicial and Legal Services Complex, lawyers on both the sides made comments about the constitution from Britain negotiated by the PAM Government of then Prime Minister Dr. Kennedy Simmonds. â€œSome said it was â€˜unique.â€™ another said it was â€˜different,â€™ another said it was the â€˜only one of its kind in the Caribbean and the Commonwealthâ€™,â€ said Condor. He recalled that at the end of the Constitutional Talks in London in 1982, the St. Kitts-Nevis Labour Party did not sign the agreement. Former Party Leader and then Leader of the Opposition, Sir Lee L. Moore is known for his strong statement on the Constitution. â€˜This Constitution that is being imposed on the people of St. Kitts and NevisÂ fits a Club or Party Executive to keep the bad boys in check, but for a country it would only bring chaos and confusion,â€™ said Moore. Earlier this year Deputy Prime Minister Condor blamed the constitutional nightmares that confront St. Kitts and Nevis on the Peopleâ€™s Action Movement (PAM) Kennedy Simmonds administration when it took the Federation into Independence in 1983. 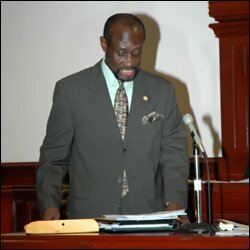 Mr. Condor singled out sections of the constitution that bars nationals from being elected or appointed to the National Assembly if they hold dual citizenship, gives the island of Nevis the right to secede, gives St. Kitts an equal number of seats in the National Assembly and makes it mandatory that Nevis must have one-third of the seats in the lawmaking body.